Basic Trig ratio problems are very important when dealing with triangles. In the below questions we will learn how to find the values of the other ratio where one ratio is given. 1. If sec θ = 17/8 and θ is a positive acute angle, find the value of csc θ using Pythagoras theorem. 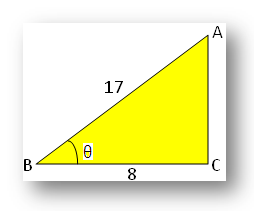 Hypotenuse = BA = 17, and Adjacent side (or base) = BC = 8. In this question on Trig ratio problems we will learn how to find the value of sin θ when θ is a positive acute angle. 2. If tan θ + sec θ = 2/√3 and θ is a positive acute angle, find the value of sin θ. According to the problem, θ is a positive acute angle; so, we neglect, sin θ = -1. The below solved Trig ratio problems will help us to find the values of the ratio using trigonometric identity. 3. If θ is a positive acute angle and sec θ = 25/7, find the value of csc θ using trigonometric identity. ⇒ csc θ = 25/24 . In this question on Trig ratio problems we will learn how to find the minimum value of the given T-ratio. Therefore, the minimum value of cos2 θ + sec2 θ is 2.